The main idea of all the verses of Nostradamus about our time of the end of the cycle of consciousness – to provide information about the existing way of humanity's transition to immortality. This is even written in the Bible. However, information about the possible immortality sounds for the modern man as a very fantastic. However, the time has come and this prediction will come true. The great prophet Nostradamus in his writings about the events of our time has shown that today humanity wandering in the darkness of deep misunderstanding of the future. He vividly revealed the great secret of immortality, in which the transition is possible for humanity right now, today. However, he warns of impending catastrophic changes on the planet that can lead unsuspecting humanity to sudden death. And then it will be already too late to decide something. The genius foresight of Nostradamus indicates humanity given from the Above the only way for the continuation of life, the path to immortality, which mankind will receive in the new cycle of consciousness development – in the cycle of Correction. The prophet warns that about the future events humanity can only be informed from the Above. However, the decision to unite consciousness for the Transition into the next cycle of life, humanity needs to take only by its own, and no one can help him in this and make a decision for him. Because, having taken the decision for the Transition the consciousness of mankind will cause an action that will help him to achieve immortality! Nostradamus reveals to mankind the greatest mystery of the path to immortality in many drawings. 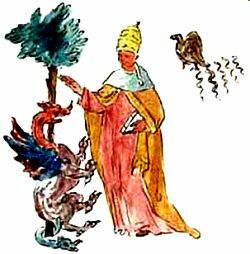 In many pictures Nostradamus is presented the Peacock that symbolizes the sacred bird Phoenix. According to legend, in anticipation of his death, Phoenix sets fire to himself with his nest, and from the ashes is reborn the newly renovated Phoenix, continuing the journey of life. This legend is about the transformation of the Phoenix very vividly describes the process of the Transition of humanity to the Highest level of the material world. At the face of the deadly threat of global cataclysms humanity through the united consciousness should cause the laser beam, which will destroy our bodies on the level of the Crystal structures. At the same time renewed humanity will arise again at the Highest level of the material world. So, will happen the General resurrection and the life of humanity will continue in the new cycle, in which will acquire immortality. Nostradamus drawing, depicting Phoenix bird with a human head, clearly conveys information about the Transition of mankind through the united consciousness by repeatedly using of digital and analog symbols. Picture tells about the stages of the Transition. The destruction of the body at the level of the Crystal structures depicts the flames. The laser beam caused by the united consciousness of humanity, represents the handle, remained from the Sword. The Transition to the Highest level of the material world through the united consciousness of humanity is presented by the crescent of the united consciousness with five stars, located at the top. Five stars inside the crescent on the top points to the fifth level of consciousness - the united consciousness, emphasizing the number five. In addition, the blue circle within the crescent with five stars shows a shift of the brain areas of the individual cells of people at the unification of consciousness of civilization. Each star is formed by the intersection of the three lines that depict the three previous levels of consciousness, entering into an individual human cell. On the other hand, these three lines form six ends, meaning the carbon nature of our life. The blue color inside the circle indicates the Highest level of the material world to which humanity has to make the Transition. Curved Neck of the Phoenix portrays the union of two individual cells of two people. About the unification of the cells also inform a double bend of the right ear. Back and neck. 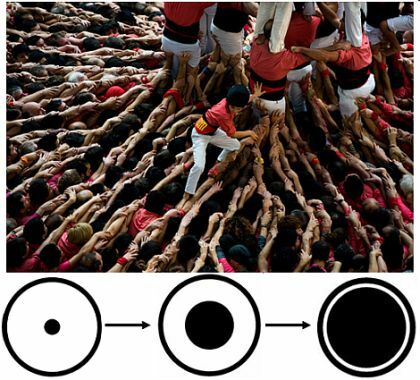 Combining of consciousness of humanity is shown by the large number of individual cells of people depicted by numerous semi-circles with small circles under them, covering the back, neck and tail on both sides. Three stars over the back and around the curved neck depict three previous levels of consciousness, entering into an individual cell of each human. Extended area of the brain of the united cell, as a result of unification of consciousness of humanity, depict the tail in the form of rings, as well as a curved back. Tail as a ring. Nine Stars in the curved as a ring tail three times emphasize three previous levels of consciousness, which are included in the human cell. They warn of an extremely wide border of individual cell of humanity shown by broad tail, which prevents the unification of consciousness. In this case, one star at the bottom indicates the individual consciousness. Two stars on the top indicate the unification of two people' consciousness. Two pairs of three stars in the center represents the unification of two people' consciousness, each element of which includes three previous levels of consciousness. Thus, the location of stars in the tail shows the transition of the individual consciousness in the united. The Cap and the Crown on the head of the Phoenix shows the need of the Transition from the individual human consciousness, depicted by a small circle at the top, in the united consciousness of humanity, which is represented by the Crown with a broad base. Eight teeth of the Crown in the form of zigzag indicate the unification of consciousness of four pairs of people. Each tooth of zigzag of the Crowns, on the one hand shows the unification of two people' consciousness, and, on the other hand, indicate an extension of the brain area, when combined consciousness. Two curved ears and beard form a crescent of the united consciousness. This shows that mankind has heard information about the Transition and caused the laser beam. The human face depicts semi-oval of the Transition. Beard means that the legend of the Phoenix is very ancient, and it is represented in the folklore of many nations. Conclusion. The Picture of Nostradamus «The Bird Phoenix » indicates the only way to save humanity from global disasters - to make the Transition to the Highest level of the material world through the unification of consciousness where humanity will acquire immortality. In the center of the picture are shown three columns. On two columns - left and central - are put the busts of people, and on the right column there is no sculpture of the man. On both sides of the picture are shown trees. On the left side is the fir-tree and on the right side - are placed three cypress trees. Let's consider, what explains this picture. Bust of the king on the left column. The left column shows the bust of the king in a red dress with a golden crown on his head. 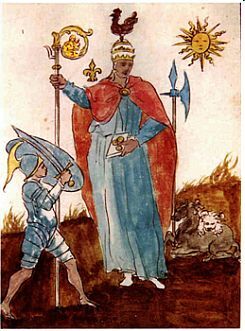 The golden color of the crown means a connection with the information from above, relationship with God, and the red color of his clothes shows the connection with the Information world. As is known, the king or emperor, i.e. the ruler of the empire, a multi-ethnic state, as well as the King - the ruler of a mono country is protégé of God. The same protégé are also the Presidents of all countries, as they by putting forward various laws improve consciousness of a lot of people. All the decisions that they make are dictated from the Above. Consequently, the leaders of all the countries in the period of their reign, through a variety of laws, carry out improvement of consciousness of nations of the earth in a certain direction. The bust of the man on the central column. On the central column is placed the bust of the man in a gray dress. This shows that it is – an ordinary man. However, his mission is to receive information from the Above in the form of prophetic inspiration. This is presented by information ribbons that entwine his bust, as well as the hand with red sleeve, that holds beginning of the information tape. Therefore, it is the Prophet who receives the information from the Above. Hand with red sleeves. This hand is stretches from one of the three cypress trees and passes through the top of the right column without human sculpture. The arm holding the Information Tape depicts the transfer of information from the Above. The red color of the clothes. Clothing of the King, as well as the sleeve, touching the right column, is painted in red color. The red color of the clothing means the Information world, i.e. the Hand and the color of the clothes indicate that this person is receiving messages from the Information world. The right column without bust. Gold plated upper part of the column indicates that the information is obtained from the Above. The ornament complements this information and points out that on this column should stand the bust of the entire civilization of Earth. Because only all mankind can decide to make the Transition into the next cycle of life, where will acquire immortality. Information from the Above warns mankind of impending disasters and the only way of salvation through the action of the united consciousness. However, humanity decides by itself - to accept this information and follow the guidance from the Above, shown in the form of the Hand or not. Columns. All three pillars round in cross-section represent brain areas of cells of people with individual and united consciousness. Thin columns represent a small area of the brain of the individual consciousness, and the wide column - an extended area of the brain of the united consciousness. The column shows the shift of the brain area at consciousness unification. This is a shift in individual cell of each human, as well as in the united cell of humanity. The Capital, i.e. top, the crowning part of all three columns is painted in gold color. In the same color is painted also the crown of the King. The golden color shows that it is the information that is passed from the Above. 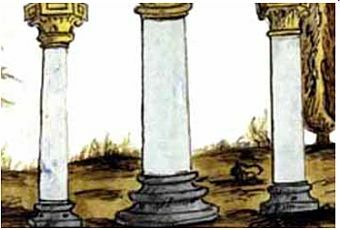 The information on the columns tells about the unification of humanity consciousness as the need for the Transition to the next cycle of life. The Base, i.e., lower part which transfers the load on the basis of all three columns is painted in gray color and is installed on the ground. This means that this information is about the people of Earth. Two columns on both sides have a square in the base that in the symbolism of consciousness means the fourth level of human consciousness. Thus, this information is about people. The middle column in the bases has three circles, with flared towards the bottom diameter. This means that the Prophet receives the information about the structure of the cells of each human, which includes three previous levels of consciousness. Furthermore, he receives also the information about the unification of consciousness of humanity, which has an action. Just the action is the basis of our Transition into a new cycle of life – to immortality! Expanding of circles shows how is expanded the brain area of the united cell by combining the consciousness of more and more people. The width and the height of the columns. The two outer columns have the same cross-section and the height. The middle column is the widest and due to the high base is the highest. This conveys the incredible importance to humanity of information transmitted to the Prophet from the Above about the merger of consciousness of civilization and its ability to cause an action. This is a brand new, unknown to mankind, but extremely important information for the Transition and the continuation of life. The Ornament. On the upper part of the column, i.e. capitals, directly under the statue is made ornament. He informs about how this person makes the decisions. The story of the ornament is presented in the form of rectangles - short and long. 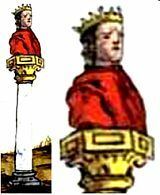 The short rectangle is depicted under the bust of the King, and the long rectangle is shown on the column without sculpture. Rectangles represent a shift of the brain areas of the cell at the time of the decision. Short rectangle constitutes acceptance of individual solutions, i.e. decision of each person. This emphasizes the small circle, located below the rectangle in its center. A small circle depicts is small area of the brain of an individual human cell. Long rectangle means adopting a single solution of the whole civilization. Rectangle, transmitting this information is shown in the column without sculpture. It portrays the extended area of the brain area of the cell of the united consciousness of civilization. This says that in this column should stand bust of an entire civilization of Earth. Only mankind can make the decision about the Transition to the next cycle of life, where will gain immortality. By making a single solution the humanity, of Earth will arise an action. This way will be launched the mechanism of the Transition. The absence of the Ornament. On the column in the center there is no ornament. 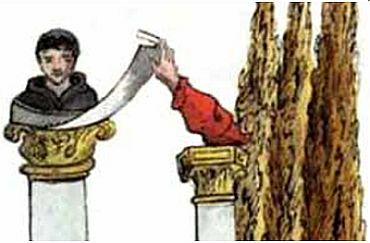 This means that a person whose bust is shown in this column does not accept the decision. He has another mission – to receive the Information from the Above. The Curl and the Expanding in the top part of the columns. The tops of all the columns under the ornament have curls and extension. Such way is illustrated the expansion of the area of the brain if the cells at unification of consciousness. The upper part of the center column without the ornament has the largest size and resembles a bowl. So is displayed the cell of the united consciousness of civilization of Earth. Fir tree is a symbol of death. On the left of the picture is shown the spruce – it's quite a large evergreen coniferous tree in northern latitudes. It is known that spruce is big long-liver. Some specimens survive for more than 300 years. However, the picture does not show a strong, high fir tree with a beautiful and strong trunk, but low and thin stunted spruce. Why? As it is known the fir tree is a symbol of death. On the picture the fir is tilted to the side of the King. This shows that the life of the Rulers of the world, as well as all other people of the Earth is very short. 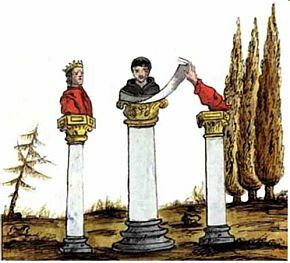 The spruce is placed behind the King, showing thereby that its base is the ultimate life. The picture says that, despite of the high position of the Rulers of the world they are all mortal. The picture also inform about a very short life and illnesses of all people of the earth. In the central part of spruce branches form a cross. 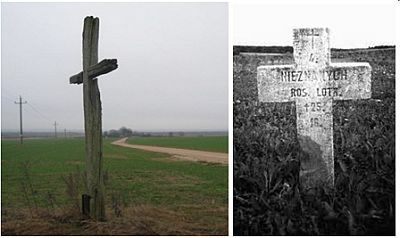 Grave cross underlines the finiteness of life. Cypress is a symbol of immortality. Cypress located on the left is the Tree of Life. Moreover, it is a symbol of eternal life, a symbol of longevity and immortality. In the book of the Old Testament, written by the prophet Ezekiel, is listed among the cypress trees growing in the Garden of Eden (Ezekiel 31.8). Three cypresses indicate that all three previous levels of consciousness, connected through the unified consciousness with humanity, also will gain immortality after the Transition. The Hand in a red sleeve stretches out the Information Tape to the prophet from the cypress trees. So is shown that the prophet receives the information from the Above about immortality. Using this information, mankind will enter into immortality, in contrast to today's final life. From final life to immortality. Thus, the main idea of the picture - the Transition to immortality - represent the two outer elements – spruce and cypress trees. Just they show mankind the great opportunity to continue living through the Transition to the next cycle. The central part of the drawing in details reveals to the humanity the Instructions for the Transition to immortality. The action of the united consciousness, which should cause humanity to make the Transition, is vividly shown in another picture of Nostradamus. Cataclysm will cause the consciousness unification and the Transition. The action caused by the combined consciousness depicts human foot, which pushes the column, causing its fall. The foot will make this devastating blow when its heel will bite a snake. Snake in the symbolism of consciousness means cataclysm. So is shown that mankind will unite consciousness, which will cause an action only after the blow of cataclysm. In this figure a column shows a shift of brain area cell, in human cell as in individual, and in the united cell of mankind. Nostradamus has shown that the snake-cataclysm will bite everyone on Earth. As a result will be made the decision about the Transition. At the time of the synchronization of consciousness with a common goal - the transformation of the body will arise shifts of the brain areas in each individual cell. So as a result will be formed a single united cell of Earth civilization with shifted areas of brain. At this moment will arise the action, which is shown in the picture. This action decides the fate of the future of our civilization. Gold color. Gold color of the picture elements of the top and bottom parts of the column means that the information provided by these elements is received from the Above. Gold ring and a squared base of the column. The lower part of the round column has a square base. Over the square base is shown a gold ring. Golden color means that this information is received from the Above. The combination of the square base and a gold ring informs that the gold ring depicts the individual human cell, and the square base complements this information by passing that a person has the fourth level of consciousness. Curls, crescents and expansion at the top of the column. The upper portion of the column, colored in gold color, showing two closely spaced concentric lines. So is shown two individual cells - two people uniting consciousness. Above two lines are represented: curl on the right and the crescent on the left. This is the crescent of unified consciousness. It reports that two people have united consciousness. Unwinding curl depicts the extension of a small area of the brain of an individual cell, at unification of consciousness. Above the curl and the crescent at the top of the column is shown the extension that shows the expansion of the area of the brain as a result of unification of consciousness of several people. Combining of their consciousness depict the curl and the crescent. 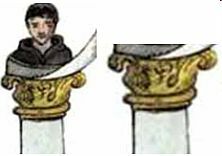 Thus, both the top and bottom of parts of the column tells about unification of people' consciousness. This information is transmitted by symbols of consciousness. The picture informs that civilization notified of coming disasters has to take the decision about unification of consciousness for the Transition, as the only way out for the continuation of life. Black Rooster of Armageddon depicted in the highest point of the picture, reports that the critical moment has come. However, the Black Rooster depicted on the head of the Woman in tiara – the main figure in the drawing. This means that she is a forerunner precursor to the beginning of global cataclysms. Consequently, the Black Rooster of Armageddon is her integral part and will appear along with her. In accordance with the prophecy of St. Malachy's the news of the beginning of global cataclysms will come down to humanity when the last Pope 112 - Pope ascend to the throne, on whose head sits the Black Rooster of Armageddon. It is this information and is represented in this picture. The Black Rooster of Armageddon is presented also on the Wheel of Time, which is stopped by the hand from the Above. However, on the Wheel is shown the live rooster who is waiting in the wings to take off, and on the head of the Woman in tiara is represented only its image. So is marked ordinariness, i.e. the Black Rooster of Armageddon is permanent belonging to the Woman in tiara. Separately, they do not exist. 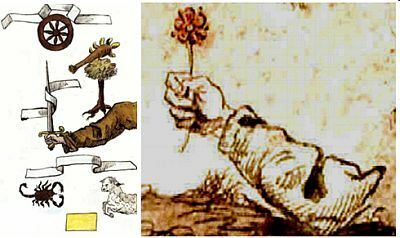 The same information about the simultaneous appearance of the Woman with the keys to the symbolism of consciousness, and the beginning of the disasters presented also in other drawings of Nostradamus as well as other artists. However, in the pictures the body of the Woman in tiara is spliced with the body of a snake-cataclysm. It is shown that bodies have grown together. Tiara on the Woman informs that it was given to her from the Above two real keys to the kingdom of heaven. These are the keys to the symbolism of consciousness, in which are written given from the Above the Instructions for the Transition of humanity to the Highest level of the material world - to the kingdom of heaven. The mission of the Women in tiara is to transmit the only way for rescue, given from the Above, to the people, represented by a warrior in armor, as well as help to make the Transition, as she is fully aware of the stages and obstacles. More details about the Woman in tiara is written in the part 2. Nostradamus: The Woman with the keys mark the beginning of cataclysm. The image of the Woman is a pictogram that opens the way to unification of consciousness for the Transition through the symbols of consciousness represented by the individual elements of her clothes, crowns, attributes, as well as the surrounding environment. White socks and bare feet. The Warrior depicting humanity is shown barefoot and the Woman in tiara stays on earth in white socks. This shows that humanity itself has no way of salvation from the coming global cataclysms, as it is completely tied to the land. This is his home. Only a completely new information for humanity received from the Above about the possibilities of unified consciousness and its action will help to make the Transition to another level of the material world, without disasters. In fact, the Woman feet are not in white socks. So is shown dematerialization, i.e. disappearance of the body at the level of the Crystal structure, where we all live today and the Transition to another safe level of the material world, about which tells the Woman. Battleaxe is a weapons displayed at the left hand of the Woman in tiara. Shaft of battleaxe rests on the horse's leg bent, and metal part is painted in the blue color of the Woman clothing. This says that mankind should not worry about the occurrence of global disasters - it is fully protected by the Instructions of the Transition that the Woman is holding in the same hand. The main thing, that humanity has to completely fulfill the Instructions for the Transition. Battleaxe in this case is a symbol of protection of mankind from destroying the global cataclysms. Horse and Sheep. Lying brown horse with a white sheep on the back indicates that the people of Earth will not be able to escape from the disasters of destruction of the planet, which will cover the entire planet, and for the salvation they must follow the instructions transmitted from the Above. Sheep, on the one hand, shows complete obedience, and, on the other hand homogeneous-resonant structure of the unified consciousness of humanity. The Instructions sent from the Above, informs about the following: Prior to the period of global cataclysms, designated by the Black Rooster, mankind has to make the Transition to a safe Highest level of the material world through the united consciousness based on the golden rule of morality - love your neighbor as yourself. The principle of the united consciousness. In his left hand the Woman holds the book with the Instructions for the Transition, on the cover of which are placed three golden circles. These three circles represent the three previous levels of consciousness, which are included in an individual cell of human depicted by quadrangle book. Thus, two circles are separated by the finger and two others joined together. Two separated circles represent two areas of a brain of two individual cells, and two joined circles - a merger of the two areas of the brain of cells of two people with united consciousness. The combination: one circle and two circles indicate the need for the Transition from the individual consciousness to the united, and reveal the Principle of the united consciousness. At the consciousness' unification from two individual cells is formed a single cell of the united consciousness with an extended area of the brain. Gold color of three circles, on the one hand, means that the information abut the principle of united consciousness is given from the Above, and, on the other hand, depicts the incredible importance of this information for the continuation of human life. The symbol of the Transition is shown above the right shoulder of the Woman in tiara. This symbol of the Transition is also shown in the coat of arms of Pope Celestine II (1143-1144). This is heraldic lily in French fleur-de-lis, literally lily flower, which is often used in the drawings of Nostradamus. The entire symbol consists of symbols of consciousness. The side curved ornamental elements are two crescent of the united consciousness. So is shown that two people united consciousness for the Transition. The upper part contains a diamond. On the one hand, the four sides of the diamond represent the fourth level of human consciousness. On the other hand, the elongated shape of a rhombus denotes a shift of the brain areas in each of the two cells, as the result of unification of consciousness. At the bottom of the ornament is shown the expansion of the brain area as a result of unification of consciousness. Three-petal element informs that in every cell of the individual human consciousness enter three previous levels of consciousness. Symbol of the transition as a fleur de lis is presented as well, and many other figures of Nostradamus. Golden color of the symbol of the Transition means that the information about the association of consciousness, which transmits this symbol is given from the Above. The Transition through the unified consciousness on the basis of deep love. The top of the scepter, the rod or a staff that holds the Woman in tiara, is ending in a miniature in the form of the curls. The miniature is located above the symbol of the Transition. The central part of the miniature is image of mother with a baby. So is shown a deep love, which should be at the basis of humanity's Transition involving in common destiny. Only love will soften the cell borders, and they will merge for information exchange and will cause the action of incredible strength. This state represents the image of a lamb. About this time the Bible tells, that: will be changed the heart of people and will turned into another feeling. (3 Esdras 6:25). The curl is composed of numerous symbols of consciousness. Curl, which is shown in the miniature, in the symbolism of consciousness means expanding the area of the brain when combined consciousness. Image of the heart, as a manifestation of love is presented in other pictures of Nostradamus. Only a deep mutual love of all members of Earth community will create a homogeneous-resonant structure of the unified consciousness of humanity. 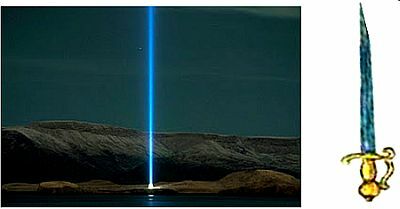 This structure is necessary for an incredible gain and the occurrence of the laser beam for the Transition of humanity. The main wealth of mankind for the Transition is love. The top of the scepter – knob is usually massively decorated with precious stones and gold, as a manifestation of infinite wealth of owner. The main wealth of mankind, as shows the top of the ornament is love and the principles of mutual understanding. Only a revolution of consciousness from hate for love will allow us to make the Transition and to continue living. War and love. Right hand, left hand. The Woman in her right hand – the hand of the action – holds a scepter with a picture of deep love and mutual understanding. This is her weapon of the Transition, it is the banner of victory. In the left hand the Woman in tiara has the book - it's the Instructions for the Transition, on the cover of which are placed three circles, calling for the unification of consciousness. The left hand is going to the heart, which holds the book with the Instructions shows that the guidelines are based on love. Humanity is depicted as the warrior in armor and a shield in his left hand. In the right hand the warrior holds a sword as a weapon of war, and in his left hand - is holding a shield - as a defense against attack. So is shown a typical human life in a constant state of war and aggression, in anticipation of an attack. Oval of the Transition and the laser beam. Through the unified consciousness humanity will create the oval of the Transitions shown in the form of a shield of the warrior in armor. The laser beam, which humanity must cause for the Transition, is shown by a sword in the hands of the warrior. According to the Information from the Above in order to preserve the life mankind has to make the Transition to the Highest level of the material world, which is shown by blue clothes of the Woman in tiara. Helmet and sword. Marked by gold color elements depict the expansion of the brain area as a result of combining the consciousness of people. Golden color means that the information about the Laws of the united consciousness represented by the elements of the picture is given from the Above. On the unification of consciousness between two people tell also two fingers of his right hand that is holding a sword. Sun – is one of the causes of global cataclysms shown to the right of the Black Rooster. 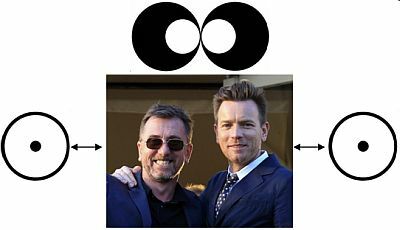 The pictogram of the sun, as in the other pictures of Nostradamus contains two types of beams. Beams in the form of a writhing snake-disasters, as well as in the form of sharp blades of swords, which depict the laser beam caused by the combined consciousness of humanity for the Transition and the continuation of life. The figure shows a man with a crescent-shaped sickle in his right hand and a red figure in the left hand. It appears that there are two types of pictures, but they both convey the same information in symbols of consciousness. Sickle represents the Crescent of the united consciousness. A man depicts an individual consciousness. Sickle represents the Crescent of the united consciousness that is required for the Transition. In one picture - the sickle touches the head of man. This emphasizes the content of the symbol the «crescent», which means the unification of two people' consciousness. Five green lines on the red figure - the unification of consciousness. Red figure is evenly divided into five sectors by the long green lines. Number five means the fifth level of consciousness - the united consciousness of humanity. The fifth level of consciousness also emphasizes the five fingers of the hand that hold this figure. Each green line shows the shift of the brain area at unification of people's consciousness for the Transition. The basis of the Transition is love and understanding. The left hand going to the heart, in which the man holds the figure, emphasizes that the unification of consciousness of the people must be based on love and the golden principle of morality - love your neighbor as yourself. Wreath on the head of Man emphasizes the expansion of the area of the brain when combined consciousness. Holographic body after the Transition. A man stands on a platform representing the level of the Crystal structures. Dark blue socks, the collar and sleeves under a light cloak emphasize the dense body. On the left side of the Man is shown only part of the human bare feet and the rest of the body - is absent. So is shown that as a result of the Transition to the Highest level of the material world the body will be holographic and invisible for the level of the Crystal structures where we live today. Thus, the Transition to the invisible for us world emphasizes the part of the bare feet, standing next to a dark blue socks. Two semi-circles represent the Principle of the united consciousness. Two united semicircles shown at the bottom of the platform to the right of the Man, represent two uniting individual cells, i.e. two people uniting consciousness. So is shown the basis of the Transition - The principle of the united consciousness. Thus, each semi- circle depicts one man and two semicircles depict two people that uniting consciousness. Dense and holographic body at different levels of the material world. Two semi-circle on the platform are painted in two colors: dark blue - at the bottom and white - from the top. Dark blue color of the base of two half depicts the dense body at the level of Crystal structures. The light color of semi-circles on top shows a holographic body at the highest level of the material world, where we will make the Transition. Since each of half circle depicts one man, then its two-layer colors repeats the dual-layer color of the Man' clothes. In this case, the dense body of the Man is marked by dark blue color of socks, collar and sleeves, and light colored free-falling cloak represents a large holographic body at the Highest level. Picture tells about humanity's transition from the finite life to immortality, which it will get on the Highest level of the material world. The Transition. Dry, thin, stunted spruce, sparse vegetation in the form of herbs and also stones depict the finite of life at the level of the Crystal structure. 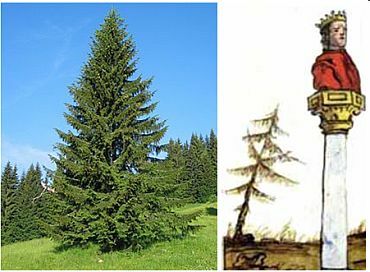 Stunted spruce – a symbol of the finite of human life, also is shown in the other already decoded Nostradamus picture 23. From the ground, almost touching its surface, up to a hanging in the air tiara, stretches out the Hand which holds a red flower. So is shown the necessity of humanity's Transition to the Highest level of the material world, which it has to make in accordance with the Instructions given from the Above. Instructions for the Transition, written in symbols of consciousness, will give the Woman, who is also given the two keys to read them, so on her head is shown papal tiara. Holographic body at the Highest level. The Woman in tiara is depicted in many drawings of Nostradamus. However, this figure shows only a tiara, which hangs in the air, and the Woman disappeared. So is shown that after the Transition to the Highest level of the material world and a body becomes a holographic and on the level of the crystal structure, it will not be seen, will be invisible. The action of the united consciousness. In the right hand is griped the red flower which represents the action of the united consciousness of humanity for the Transition. The Hand with the flower informs that for the Transition to the Highest level of the material world humanity has to unite consciousness at the level of the Crystal structures. In the picture 68. The Hand with the Sword the action of the united consciousness also is shown by the right hand with a sword, depicting the laser beam for the continuation of life. The Flower, griped in the right hand, portrays life. Thus, the picture informs that transfer from the ultimate life to immortality humanity can make only through the action of the united consciousness and the Transition in accordance with the instructions given from the Above. The picture shows the moment when the Woman in tiara by imperious gesture stops Feathered Serpent-cataclysm through unexpected message. The Woman seems to be saying cataclysm: «You can not be in a hurry! Mankind has already been informed about your attack and will not be destroyed. It is ready to make the Transition to the Highest safety level of the material world.» With surprise that his cunning plan of sudden attack is revealed, shocked by the news, the Beast even sit on his tail, holding all four paws up and slightly opened mouth. The Woman in tiara. The picture shows the Woman in tiara with the book-Instructions for the Transition in her hand, the white cape around her neck and gold cloak thrown over red clothes. Gold color indicates the receipt of information from the Above, and the red color - to communicate with the Information world. A small additional drawing-callout, located at the level of the head of the Woman in tiara, which depicts a bird, located over five writhing snakes, says that the Woman in tiara already informed about the occurrence of global disasters and the necessity for humanity to make the Transition-flight to save lives. This information is complemented and reinforced the Book with the Instructions for the Transition in the hands of the Woman in tiara and also the Tree of Knowledge and Life. Tiara is three-tier gold crown. Three-tiered tiara crowned the Crescent, located at the top. Decoding of the tiara-pictogram comes from the top to bottom. Crescent informs about the merger of consciousness and three levels of the corona means three previous levels of consciousness that are included in the human cell. The Crescent of the united consciousness informs about unification of consciousness. As a result, the brain areas shifted from the center to the edge of the cell, and was formed a crescent. The crescent on the top of the tiara means that the unification of consciousness - is the pinnacle of the relationship between people on the planet. The bell-shape of tiara indicates the expansion of area of a brain of merged cell. This means that more and more people are united consciousness for the Transition. White cape around neck on the one hand represents the area of the body of individual cell with the area of the brain of the cells in the form of a human head. On the other hand, the bell-shaped white cape, as well as the crown, represents the expansion of the area of the brain of the united cell due to joining of more people that unite consciousness. Feathered Serpent-pictogram. Sitting on the ground Feathered Serpent with a twisted tail around the Tree of Life, reports that the onset of global cataclysms on Earth is already predetermined. And they have to come at the specific time. Shown image of the Serpent informs at the same time about the mortal danger of onset of global cataclysms, and also about the only way of salvation, which depict his wings – about the Transition-flight of humanity to a safe level. The Serpent's mouth ajar means that global cataclysms are on the doorstep. That is why with the first of them met nose-to-nose the Woman in tiara. At the time, as closed mouth means that the onset of global cataclysms is already predetermined, but they will come not soon. The image of the Feathered Serpent to the closed and open mouths is often found in various Mexican complexes. Paws of the Serpent. The Serpent has fours paws. Number four means the fourth level of consciousness - the consciousness of individual human. Each of the four paws is three-toed. This shows that each paw represents an individual human cell pf the fourth level of consciousness and three fingers represent the three previous levels of consciousness, which it contains. On the other hand, the number four means two pairs - unified consciousness of two pairs of people. The action caused by the united consciousness of people is shown in the form of wings of the Serpent, which have a lifting force. Thus, through only uniting of consciousness humanity can make the Transition-the flight. In terms of the symbols of consciousness, the Serpent' body is similar to the body of the Little Lion in the picture the Wheel of Event, as the two bodies are composed of three crescents of united consciousness. One crescent forms a curved as a half-wave the neck with the Serpent's head, and the other two crescents depict curved chest and the back of the monster. Legends of the Plumed Serpent. Divine serpent Quetzalcoatl, or the Feathered Serpent – is a fabulous hybrid bird of paradise (quetzal) and snakes (coatl). It is a bridge between the divine and the earthly. It combines the symbolic qualities of birds and snakes as a dual system, which connects heaven and earth. Feathered Serpent commands the elements of Heaven and Earth. The fire, water, and all life on Earth are under his control. Powerful element bows to his authority. And so it is, in fact global cataclysms will destroy everything on Earth! According to the legend of the Indians of Central America, Quetzalcoatl left the people, floating away on a raft of snakes in the ocean - but the day will come when he will return. And indeed it is, because in the preliminary cataclysms area of the planet will be subjected to a tsunami strikes! Quetzalcoatl is the sign of the cross, that is, the intersection of earth and heaven, where the horizontal is the wisdom of snake, and the vertical is brightness of bird. It is believed that for mankind is very important to solve the mystery of the Feathered Serpent. And it is so, because only in this case, humanity discovers the occurrence of global disasters and will be in time to make the Transition and, thus, to continue life! Bird and Snake. On the left side of the back, behind the head of the Woman in tiara on a small drawing-callout is shown the bird holding in the claws one of the five writhing snakes. Snakes represent mortal danger of global cataclysms. Number five means the fifth level of consciousness - the unified consciousness of humanity - is the only way to save lives. The numbering of snakes is from right to left. The first three small snakes represent three previous levels of consciousness, entering into human cell. First, the smallest snake represents the level of consciousness of the stars. The second and third snake is the level of consciousness of inorganic and organic nature of the planet. The fourth snake is the biggest and fat, depicts a fourth level of consciousness is the consciousness of individual human. So is shown a huge ego of each human and at the same time a deadly threat to humanity - to remain in the individual mode of consciousness and do not unite it for the Transition. The fifth snake represents the fifth level of consciousness is the unified consciousness of humanity. It holds in its talons the flying bird. This allegory shows that despite the incommensurable forces – the Bird of the Transition can overcome the multi-headed hydra - the Snake-cataclysm. The picture shows - the Bird is stronger than the Snake because it can take with it the humanity to another safe level of the material world, without disasters. There, at the Highest level humanity will continue life in the cycle of Correction. 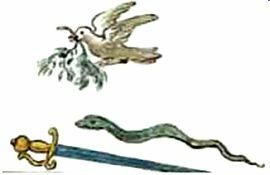 This symbolism of victory the bird over the serpent is often represented among the peoples of the world, where as the bird winning the snake is shown the eagle. 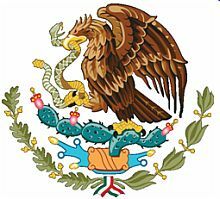 In the coat of arms of Mexico is depicted an eagle sitting on a cactus with a snake in its talons. Humanity has to make the Transition-flight on the top level of the material world, which depicts the blue color of the wings of the Serpent. The picture shows that the received by humanity information disarmed disasters and deprived them of sudden. Humanity is already prepared and before they occur it will be in time to make the Transition, and will not be destroyed. It is known that an eagle with a snake in its talons – the symbol of victory of the Transition. So, the victory of the Transition – this is the leitmotif of the drawing. The picture warns about the failed Transition. This is indicated by two elements of the picture. First of all - this is a branch-trident depicts a human in the beak of the black bird. In addition, it is the blood-red flower with three petals, depicting a human who hangs out on a long rope, representing torn out insides. The picture contains two levels of information, divided by a horizontal line. In the upper part of the picture, consequently, in the center is shown the man. However, the cross is not simple. Each of its four parts is shown with an extension that represents the expansion of the area of the brain at unification of consciousness. The yellow color, in which is painted the cross indicates that the information about the necessity to unite consciousness for the Transition mankind has received from the Above. To the right of the cross is depicted a helmet is a symbol of war, and at the right is shown the device with funnel-shaped opening on both sides to pick up and amplify of the sound waves. The upper part of the picture tells that humanity has already received from the Above the information about the need to unite consciousness for the Transition, however, does not listen to this, and continued to lead his line - separation and war. The lower part of the picture reveals the sad result of the unfolded events. To the line separating the two levels, is connected by a crescent of unified consciousness a large bowl, depicting the cell of the united consciousness. However, the integrity of the ball is broken. As a result the insides in the form of a three-sheeted flower of blood red color had fall out and dangles on a long rope. Each petal is bent as a crescent of the united consciousness. So is shown the three previous levels of consciousness, entering into an individual cell of a human. Hence, from the united cell of humanity is ripped his insides - humanity is destroyed. On a plot of land of yellow-brown color with dry grass sits a black bird. A bird in its beak holds a trident - a symbol of individual human consciousness. 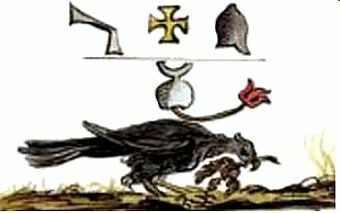 The black bird with a trident in his beak informs that mankind had remained in the individual mode of consciousness and could not unite it for the Transition and the continuation of life. The figure shows that the greed and power of private property were stronger than the desire of mankind to continue living. As a result, humanity has been destroyed. Picture tells that humanity received in advance the information from the Above about the need to unite consciousness for the Transition. However, it does not listen to this, and continued to lead his line - separation and wars. As a result, not forming a unified consciousness and not made the Transition to the next cycle of life, mankind was destroyed of negative events of global catastrophes beginning that were stronger than its capabilities. Only global cataclysms will force humanity to use the great possibilities of unified consciousness and make the Transition to the continuation of life. The picture informs that before the beginning of global cataclysms of the destruction of the planet humanity from the Above will be given the Information about the possible salvation. Through the Transition to other Highest safe level of the material world, without disasters. There will begin a new cycle of life. This Transition mankind can make only by uniting consciousness and causing the action an incredible force in the form of the laser beam. The symbolism in the picture of Nostradamus: Snake - the symbol of cataclyms. Sword - the symbol of the action of the united consciousness of civilization in the form of the laser beam, which will ignite the unified consciousness. Dove with a twig of peace - the messenger of the Holy Spirit. A twig of peace means peace and harmony. The Sword in the pictures of Nostradamus shows the action of the united consciousness of civilization, which will cause the laser beam necessary for the Transition to the highest level of the material world through the destruction of a body. However, in real life sword-ray laser - as an instrument of consciousness is not claimed. So he lies horizontally. Sword handle is colored in yellow. This indicates that the information about changing the mode of consciousness from individual to united for the humanity Transition to the next cycle of life, is given from the Above. Moreover, the information from the Above reveals the possibilities of the united consciousness of civilization. It turns out that human consciousness is able to trigger an action, in the form of a laser beam, which will allow making the Transition to another level of the material world, and thus be saved from disasters. 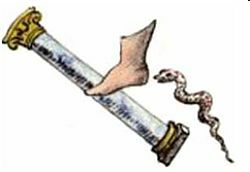 Global cataclysms in the figure are shown by the snake, which separates the sword and the flying Bird. Small ball on the handle. Sword handle consists of symbolic consciousness. So, a little ball on the end of the handle represents area of a brain of an individual cell. A small circle is attached to a large ball, which depicts the area of a brain of the united cell. The Big ball is attached to the elongated element, which depicts an oval of dematerialization and the Transition. Below the elongated element is placed a horizontal element of the handle, which comprises two crescents of the united consciousness. 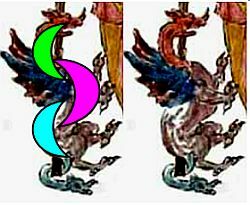 Curved element, attached to the Big ball and the horizontal element also includes several images of crescents of the united consciousness. Blade of the Sword is depicted as long triangle, which means expanding of area of a brain of the cell. It happens when people constantly join to the community of united consciousness up to the formation of the united consciousness of civilization. Sword, painted in blue, depicts the laser beam necessary for the Transition. The Bird and the branch. In the bird's beak is the branch, consisting of two parts. So is illustrated the principle of the Transition through the unification of consciousness. The first part consists of two branches and the second part - of the three. The total number of stems is five. Thus, the bird carries information about the transition through the united consciousness corresponding to the fifth level, represented by five trunks. The upper part of the branch, clutched in a bird's beak is curved in the form of a crescent – the symbol of the united consciousness. The picture informs that before the start of a global cataclysm mankind will receive the information from the Above about the possibility of the unified consciousness to transform the density of a body. Only a snake - the symbol of cataclysms, mankind will force humanity to manifest the possibility of consciousness and take advantage of them and causing the action in the form of the laser beam. As a result the Earth's civilization will make the Transition, depicted by the Dove - white flying bird. Heart with ornament. Around the heart are shown five symbols of the Transition of blue color. Number five means the fifth level of consciousness - the united consciousness of civilization. Only it will allow humanity to make the Transition to the Highest level of the material world. That is why the five symbols are painted in blue – the color of the sky. On the other hand, they resemble the birds that carry in the air before the eyes of all civilization a huge poster with the image of the heart. This image as if appeal: only love can help civilization to make the Transition! Golden ring. On narrow ring are depicted small circles. They represent the brain areas of individual cells. A large ring on the one hand, depicts the extended area of the brain of the cell of the united consciousness. On the other hand, the ring is the symbol of the united consciousness of civilization. Unification of consciousness of civilization. Thin ring depicts a thin border of the united cell, all inner part of which is filled by the area of the cell' brain. This extension of the area of the brain of the cell is only possible if consciousness unites the whole of civilization. Thus, the ring tells that the people of Earth have started to united consciousness and continued the process as long as it does not cover the whole civilization. Oval of dematerialization and the Transition. In addition, the ring shown at the angle depicts a pointed oval of dematerialization and the Transition. This oval arises only at a deep association of consciousness and the overlapping of the brain areas when happens an increased exchange of information. Such deep unification of consciousness is possible only on the basis of love, compassion, and a deep understanding of people all over the world. The Turtle informs: how slowly is spreading information about the Transition! 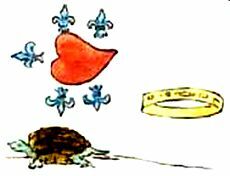 Turtle, on the other hand, also reports about the association of consciousness of humanity by symbols of consciousness. Huge shell, consisting of individual plates represents the united cell of humanity, which comprises a plurality of human individual cells. In addition, the texture of each plate of turtle' armor depicts the expansion of brain areas of cells by joining a growing number of people. Snake' muzzle of turtle warns of global cataclysms. Two legs reveal the principle of the united consciousness. Vitally important information, but too long path of its transmission. The way along which is crawling the turtle is marked by a long line that covers all elements of the picture, as if summing up the data being transmitted. Pictured in the bottom of the picture turtle conveys important warning to mankind. She talks that vitally important information about the Transition to a safe level of the material world through the united consciousness spreads in the world too slow. It is mortal danger to be late! Nostradamus transmits to humanity specified from the Above the way to a brighter future through the Transition to the Highest level of the material world, in spite of deadly attacks of started disasters across the globe. Nostradamus warns of mortal danger of the Transition delay, as well as the need to change the basis of human consciousness. Deeply worrying for the victory of the Transition, Nostradamus refers with the great request to each of us to change the callousness and hatred in our hearts for love and understanding. Without this revolution of consciousness for humanity is closed the only possible passage to a bright future. Love, understanding and mutual support – is the foundation of relationships in the universe, but humanity has a fundamentally different position. Nostradamus warns that the Transition to the future will be opened only for humanity with renewed consciousness and is necessary to do first, but decisive step in the community of people of higher consciousness of the universe. The Transition - is the final stage in the development of human consciousness, this is a test of maturity.